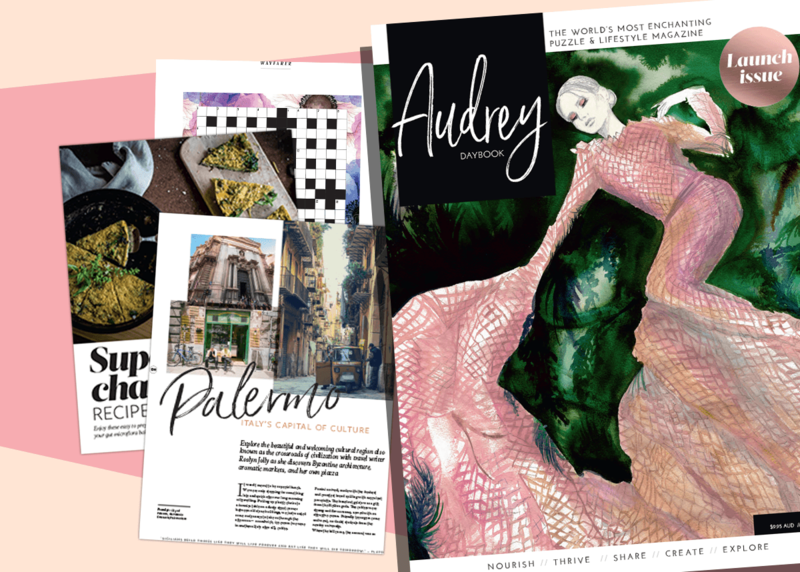 We interviewed publisher, Rachael Northey, to get the inside word on Audrey Daybook the new mag that combines lifestyle content with an array of puzzles. Can you describe Audrey Daybook? Who is it for and what is its mission? In creating Audrey Daybook, we wanted to offer something entirely new. We wanted Audrey to be interesting and challenging and charming. With the classic art of puzzling back in vogue, and mindful activities being embraced as essential, women are seeking more substance in what they read. We believe that their complexity and intellect should be rewarded with a publication that provides unique and authentic content. We imagined a woman who loves language and reading. She takes a world view, enjoys good food and wine, and time with family. She likes a touch of luxury in her life. She values crossword and puzzle content that reflects her passions, where the puzzles entwine artfully with sophisticated editorial. We realised that there was no perfect puzzle magazine experience for that reader, and so we decided to create one! What will Audrey look and feel like? Audrey is beautifully presented and recognizably luxe. It’s the kind of magazine that wouldn’t look out of place on your coffee table, and yet we encourage you to write in it, to interact with the pages. There’s a certain sort of decadence to writing in something that doesn’t feel disposable – like using your ‘special occasion’ china every day. It’s why we call it a ‘daybook’: it’s a magazine to enjoy using each day. Audrey’s quality matte pages are filled with rich jewel-tones and whimsical illustrations. The bespoke crossword and puzzles woven throughout are what readers are sure to find surprising – we’ve been very successful in making these pages have all the excellence you’d expect from a Lovatts puzzle, but they are presented in a completely new way that we think is delightful. There are seven sections of Audrey Daybook - Thrive, Share, Nest, Glow, Nourish, Create and Explore. They do sound enchanting. Can you give us an example or two of the kind of articles and features we might encounter? THRIVE - features helpful guides on mindful activities, tips on maintaining your bodily wellness and quintessential puzzles including a wordsearch and crossword. SHARE - is about both our local and global community. NEST - includes a lifestyle guide with hints on creating a home that makes your spirit sing. GLOW - is about nurturing your instinct for beauty. NOURISH – is about feeding your soul through food and drink . CREATE chapter recognises the soul-soothing effect of creativity. EXPLORE chapter, discover the places you’ve never known you always wanted to visit. What do you think readers are going to love most about Audrey Daybook? Readers will love that Audrey is something entirely new. Those who are long-term puzzle fans will wonder why there wasn’t a magazine like this before, while many others who have never felt compelled to buy a puzzle magazine will suddenly find it’s their new favourite pastime. It must be so exciting to launch a new magazine. Are you finding some people are surprised too?! It really is exciting! As Australia and New Zealand’s largest publisher of puzzle magazines for almost 40 years, the Lovatts name has become synonymous with crosswords. So, I have found that people are both surprised and delighted to hear we are doing something new and we are looking forward to meeting a whole new community of Audrey readers. For those who do feel drawn to subscribe to Audrey Daybook, we would love to hear what you think of the magazine once you receive it. If you’d like to share your thoughts, or perhaps your stories of what you’ve learned or enjoyed, please write to us at editor@audreydaybook.com. To get Audrey Daybook's special launch offer CLICK HERE. Subscribe by midnight 23 August and you'll receive the launch issue!